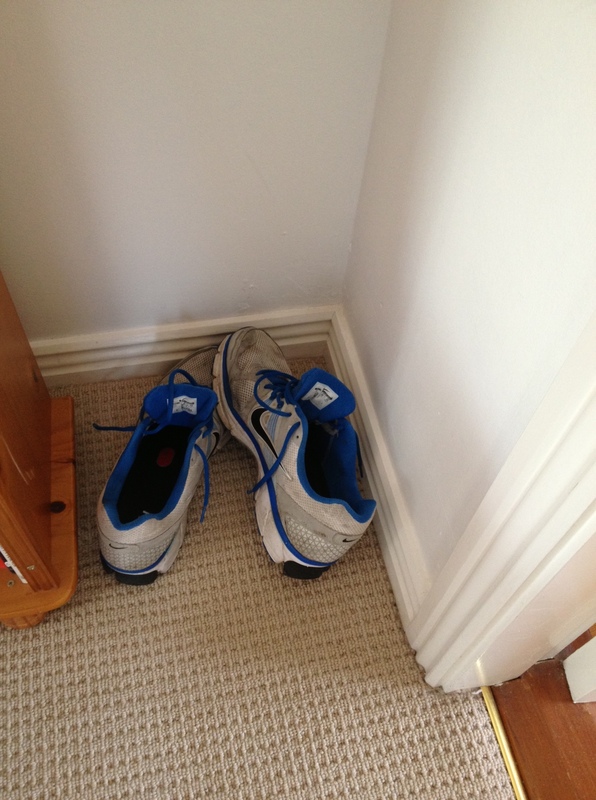 Here’s two things all runners hate. 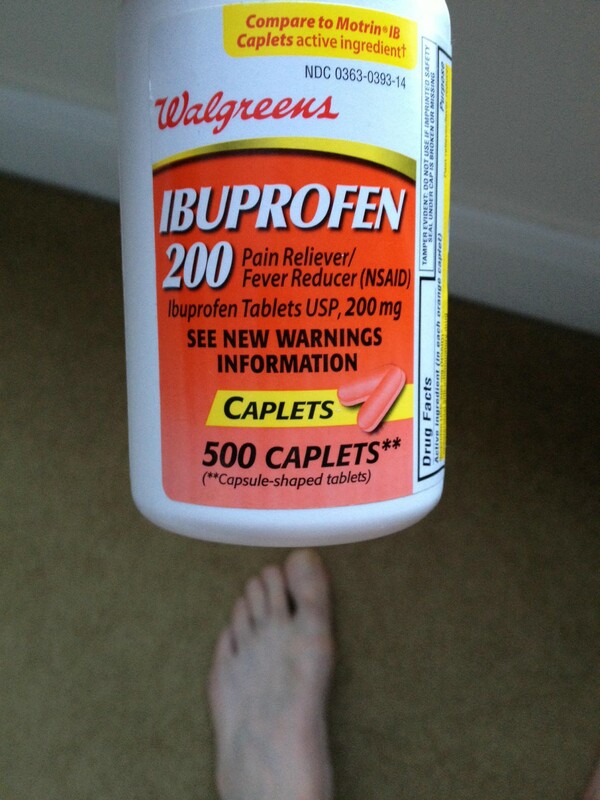 Anti-inflammatory meds and empty shoes. One of these is bad enough, both means you’ve either overdone it or been unlucky. And so it’s been for me this week. What started as a careless impact onto a piece of cracked pavement three weeks ago became, by last weekend, a darting pain in the joint of the big toe of my left foot. The two weeks in between were where, as they say in the west of Ireland, Aughrim was lost. I continued to run on the sore toe, and this led to a sore foot, which led to a second sore foot (as one overcompensated for the other), a sore leg and, eventually, (there’s a pattern developing) two sore legs. There’s a simple question here, of course, that you don’t even need to ask. But why couldn’t I stop running? Despite the darts of pain, the dull ache afterwards, the stiffness, the interrupted sleep and the frustration of all of the above, I kept it up. So, 120k later and in considerable discomfort I eventually decided to take a week off. It’s my first week’s break in 21 months, a period which encompassed two Irish winters, one Irish summer (indistinguishable from an Irish winter, for the most part), my wedding and a couple of transatlantic and other trips. It also covered a couple of weeks of shin splints and sundry bloodied toes. So I’m probably due a break before I suffer one – at least that’s what I tell myself. But, as most runners know, a short-term injury spells at best boredom, at worst outright frustration. In my case it’s constantly checking my foot and counting down the days to the end of my time off (having self-diagnosed the injury as a minor toe sprain). As I’ve waited this week, fidgeting, glancing at my running shoes and thumbing through my albums, I’ve wondered why no-one’s written a suite of songs about sport injuries. Perhaps they have. I vaguely recall seeing a Tom Petty interview in which he spoke of writing his song The Waiting while he recovered from a broken arm, unable to play his guitar. Beyond that though there’s no Chariots Of Fire for the hobbled set. Maybe it’s time to write one. Or crank up Blood on the Tracks. You’re Irish? You like to eat pasta? No you don’t. Not really. 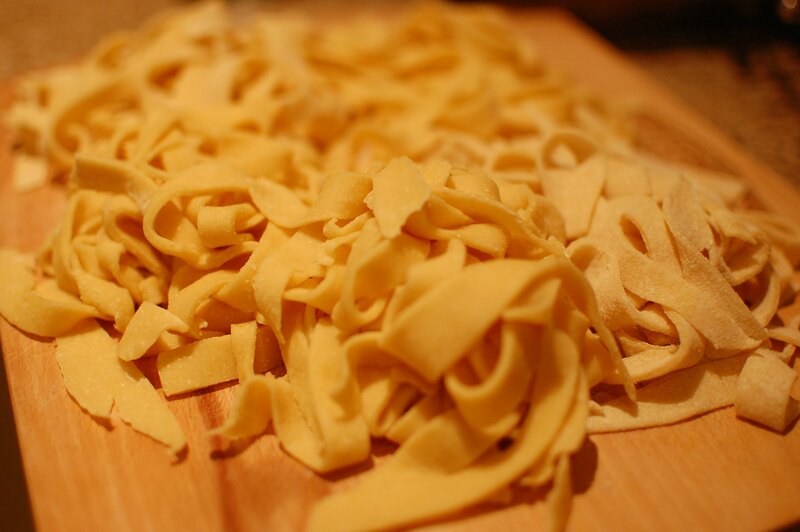 Each Irish person eats a grand total of 1 kg of pasta every year. That’s less than the hardly-well-known spaghetti-loving nations Guatamala (2kg) and Dominican Republic (4kg). Needless to say it’s nowhere near the Italians’ incredible 26kg. In fact even the rice-renowned Japanese consume more of the carb than us (1.7kgs, for the record). Irish consumption equates to about eight platefuls per annum. That’s one measly serving every six weeks. Part of the reason for our lamentable take-up of one of the world’s most popular food staples may be the longstanding Irish obsession with potatoes. The most recent stat I can find sees us sucking down a staggering 143kg of spuds yearly. (This is nothing compared to annual consumption of 766kg at the outbreak of the Great Famine in the 1840s, mind you). It may also be because we prefer pizza. Or fried fast food. Who knows? None of this occurred to me when I recently entered the kitchen, with An American In Ireland, to make some pasta. Yes, that’s right – make. For many years pasta was something that, for me, had a five-step prep: snip, empty, boil, simmer, serve. 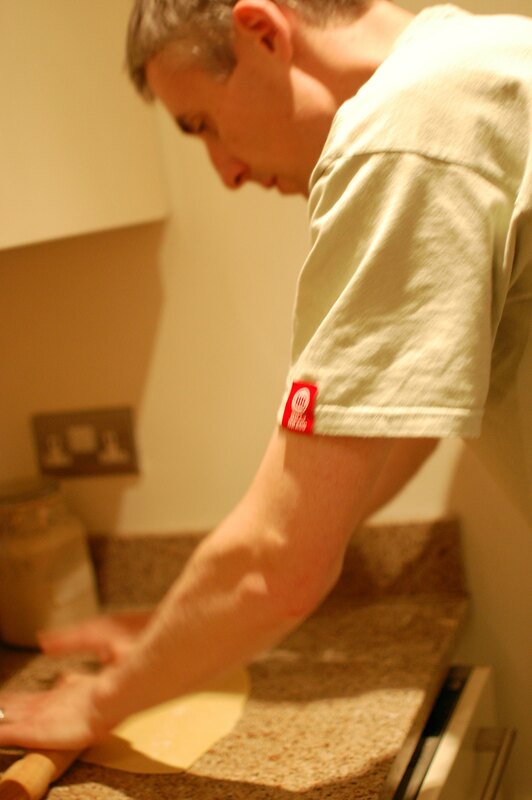 But a successful dip a while back into the world of gnocchi-making convinced me to try making my own. And, after three decades, I’ve also grown bored of the ‘boil, steam, bake or fry’ potato. So pasta fresca it was. This was my first attempt too, but (as you might have read) I’m recently got hooked on the cucina povera recipes of Carluccio and Contaldo. If I’m being honest it wasn’t the final taste I was going for (in the end I actually forgot one notable ingredient, a case of cucina idiota), nor the appearance. What struck me as clever was the way you could mix the dough one-handed on a flat surface, by making a little crater in a mound of flour and dumping two eggs in. This was cuisine refined to a level so simple it didn’t require utensils. It was cooking, alpine style. Pasta’s not something you should really need an individualised recipe for (at its simplest it’s all of two ingredients), but I used Contaldo’s one for tagliatelle, from his recent book. This involved using my most versatile kitchen instrument, my right hand, to mix 300 grams of ‘00’ flour (best for pasta because of its high gluten content, food fact fans!) with 100 grams of semolina and two eggs. And pound, stretch, pound, stretch. I took to all this with such gusto that I neglected to add the fourth ingredient, 125ml of white wine. Luckily Clare had stepped in to add some water to the mix instead, averting a dry dough disaster. Then it was a case of making a big ball of dough (like the mixing, more fun than it sounds written here), wrapping it in clingfilm and leaving it to one side for 30 minutes. This is the point at which a sane person writes: ‘Then I took out my pasta maker’. In this case the pasta maker was me, and my wife. 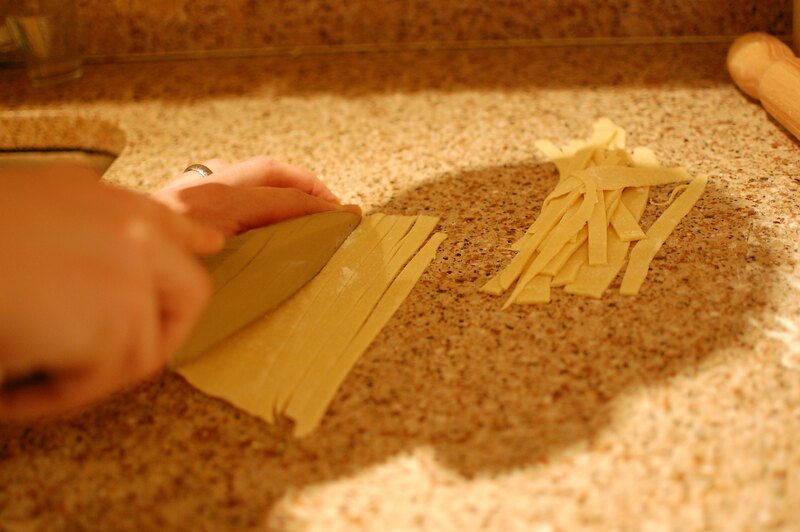 After some rolling and slicing we managed to cut our tagliatelle on the countertop. Foodies might call this ‘rustic’, I called it improvising. From there it was simply a victory lap. We boiled the tangled little mounds for three minutes in salted water, and served with a mushroom and white wine we made on the side in that 30 minute window above. So here it is. One of the eight plates of pasta that statisticians expect me to eat this year. They’ll be wrong. 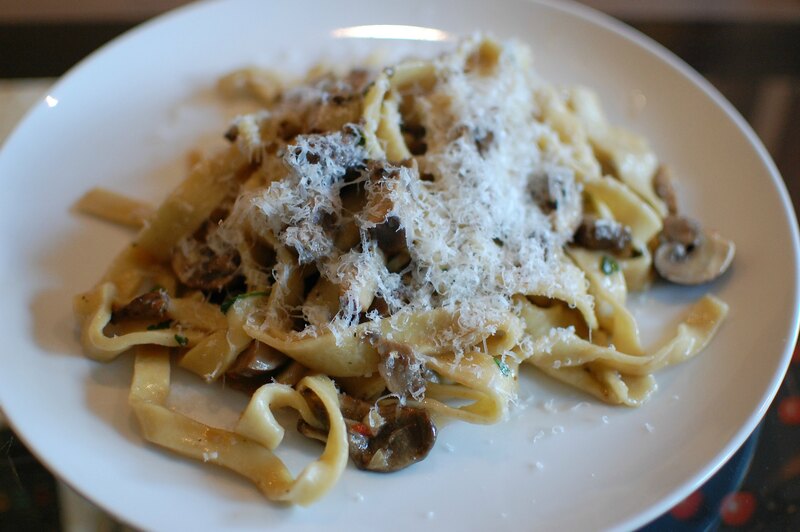 Tagliatelle al vino bianco con funghi. The veranda of a villa on the island of Capri, October 1924. A man and woman sit side-on to one another, each holding a glass. ‘I’m sick. I’m in pain. We are supposed to be celebrating. Decide. Please’. 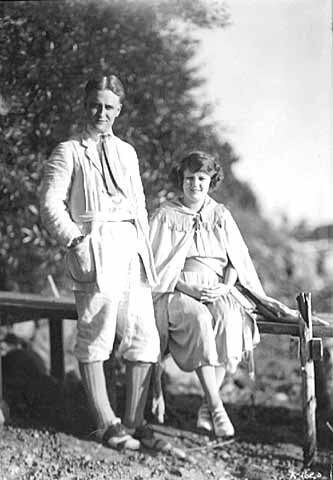 Scott and Zelda Fitzgerald (gin not pictured). Popular music and the tragic history of Nazi Europe collided before Justin Bieber visited the Anne Frank House museum and scribbled a hopeful note in the visitors’ book. But unless you were tuned in to the US lo-fi scene of the mid-90s you might have missed it. The connection is an album released in 1998 on the Merge Records label, called In The Aeroplane Over The Sea. 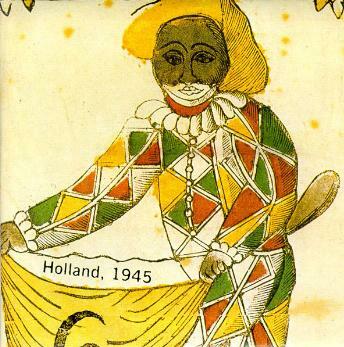 Holland, 1945. CD single cover art. The album is an opus of seesawing emotions, crashing lows and explosive highs, a mix of guitars, shouted vocals, brass and marching rhythms. Magnum’s music is not indefinable, it’s just better listened to than described. I doubt Beiber knows much of it but I doubt he’s too down with Anne Frank either.